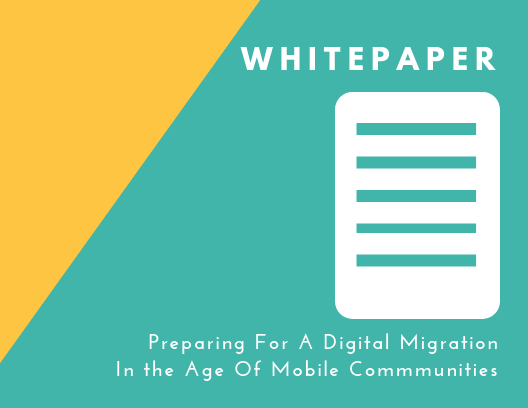 Now that over 50% of web traffic has gone mobile, your strategic initiatives must keep up. Real-time, shared experiences with a mobile-first mindset increase the speed of communication and the rate of engagement. Combine the concept of a community with the power of mobile and you create a new channel with untapped potential for engagement with your customers, employees, partners and vendors. All the information you need, to know why mobile-first, community driven experiences matter. The person(s) you want to reach—consumer and professional alike—are scattered throughout a larger society, not necessarily congregating in one area. This becomes more and more of a problem the closer to niche your business, products, or services are. It also makes it incredibly difficult to build an experience that brings them together. Customer experience is a 24/7, 365-day carousel. If you lapse, you may do a disservice to loyal customers, lose the support of others, and turn away prospective customers. Plus, modern customers demand always-on, connected experiences that they can tap into from anywhere, anytime, on any device or platform. One of the best ways to establish an active base is to develop an online or mobile-friendly environment, which employs the use of your audience, vendors and consumers. This means that when customers do not have the luxury of engaging directly, on-site, at a meeting or an event, they can turn to digital communities for instant information or on-demand customer experiences. A digital transformation applies to just about anything to do with virtual content for your business, customer engagement, and marketing operations. Just to provide a few examples, it includes elements like your company website, online storefronts, review and press sites, social media, mobile apps, mobile web experiences, and much more. Engagement is a strange but necessary metric in the enterprise world. With respect to customers, engagement can be classified as any moment they are focused on or interacting with your brand, whether through marketing campaigns, social interactions, or hands-on experiences. Like revenue, you want to be constantly reeling in or building engagement to keep your momentum going. When opportunities for engagement are high, opportunities for delivering a memorable customer experience increase as well. But what does this mean for your business? What are the trends shaping the current landscape that you can incorporate into your strategy? When you develop a community, you also create a unified digital experience across customer, partner, and employee channels. Adopting a “mobile-first” approach should really be considered an organic form of growth and evolution for your business. You are providing your audiences with the tools they need to engage with your brand. This helps eliminate the type of fragmented experiences which generally crop up in the enterprise. Developing a digital community also puts a lot of power in the hands of your customers and partners. Consumers decide when and where they’re going to engage with your brand, how much digital content they want, and ultimately how that experience is going to play out in a ‘mobile-minute’. In the modern landscape, it’s not just enough to build engagement - it must also be maintained. This is what we refer to as “perpetual engagement,” as a sustainable process for any business. The bottom line is that communities, both online and mobile, allow for the kind of interactions, relationships and experiences that drive perpetual engagement. They also provide the anytime, anywhere access that modern customers expect. You are interacting and communicating with customers, rather than talking ‘at’ them. Active communities build trust through direct engagement. You’re building experiences around conversations, which you can leverage to refine initiatives. You gain real-time insights that can only be earned through perpetual engagement with your audience. It’s 2-way communication that is always-on, always available, which is invaluable in today’s fast-paced and always on-the-go landscape.